According to House of Names, the STONESS family name was first found in Berkshire. Robert George (or is it George Robert?) Sears STONESS was born about 1809 (or is it 1816?) in Whitby, Yorkshire, England. He was the husband of Elizabeth “Betsy” (or is it “Jennie”?) Jane MCGOWAN, and later Francis “Fannie” SEARS. Fannie Sears was the daughter of Lyman Sears (1804-1858) and Fanny Nutt (1807-?). Lyman was the son of Hezekiah Sears I (1770-1819) my great-great-great-great grandfather, so my great uncle. Fannie Sears was married to Robert 22 May 1849. Robert died Aug 2 1897 at age 81, in Loughborough, Frontenac, Ontario. He passed away only 3 months before his wife Fannie. Fannie, who died 2 Nov 1897. William KNIGHT was born in 1811 in Kingston. He died in 1851 in Storrington at 40 years old. He was the father of Mahala Knight (1842-1912), who was the wife of Jabez Stoness. Ancestor Isaac Knight was born in 1650. His grandmother purchased 300 acres of land from William Penn for ₤5. His wife Mary Carver was born in a cave along the Delaware in 1667. Giles Knight came to America with William Penn in 1682. More to come on the Knight family Quaker loyalists – they have some of the more incredible family stories and a rich Loyalist background. That family line deserves its own post later. Jabez McGowan Stoness was the half-brother of Robert George. His mother Elizabeth Jane “Jennie” or “Betsy” McGowan (Gowan) was born 19 Oct 1813 in Vermont. “Jennie” had 4 children, Mary Anne, James Young, William Bradley, and Jabez. Jabez was born in Vermont in 1847. He later had half-brothers David Nutt Stoness, Robert Sears Stoness, Giles H. Stoness, Harold Stoness, Henry M Stoness, John C. Stoness, and half-sisters Jane Elizabeth Stoness, Augusta Amenia Stoness and Abigail Stoness. His sister, Mary Anne (1843-?) married Asa Pixley. Jabez seems like quite the character and appears in a few newspapers over the years. Jabez was a postman, stagecoach driver, miner, mine manager, hotel proprietor, deputy reeve, prisoner, and witness with John Sears at a murder trial. Jabez lived in Stoness Corners, now Harrowsmith, Lot 90, Concession 9, Perth Rd, Township of Loughboro. According to the 1881 Census transcript, he was referred to as Jabez Stones (1847-1916) and an English Methodist. The next entry in the census was my great great grandfather Samuel H Sears. Giles Stoness lives in Battersea at Conc. 10 lot 16 fs. Mrs. William Stoness lives in Battersea. Robert Stoness lives in Sunbury as a hotel keeper, population about 50. Jabez Franklin “Frank” Stoness was born 22 Apr 1888. He died 20 Feb 1946, age 57 years. He was a doctor in New York according to a posting on Ancestry. In 1898, John Harris Stoness marries Julia Anna Smith. Another Smith relative perhaps? In 1903, a few relatives are listed as workers in Kingston Penitentiary and the Asylum, where the Sears and Vanluven families worked. Madge Edna Stoness, daughter of Jabez and Mahala Knight Stoness married Walter J. Zapf, Sr. of New York State in 1918. They had one daughter, Irene Stoness Zapf. Madge, I understand, died from complications of a stroke suffered in Saginaw, MI. Irene Stoness Zapf married Taylor Lyman and they had two children, Gerald Lyman (who lives in California) and Madge, who lives in England. Walter J. Zapf, Sr. then married (in 1930) Kathleen M. Welch of Mechanicsville, NY (who is my grandmother). Stoness Corners was founded by Jabez and his brother James. 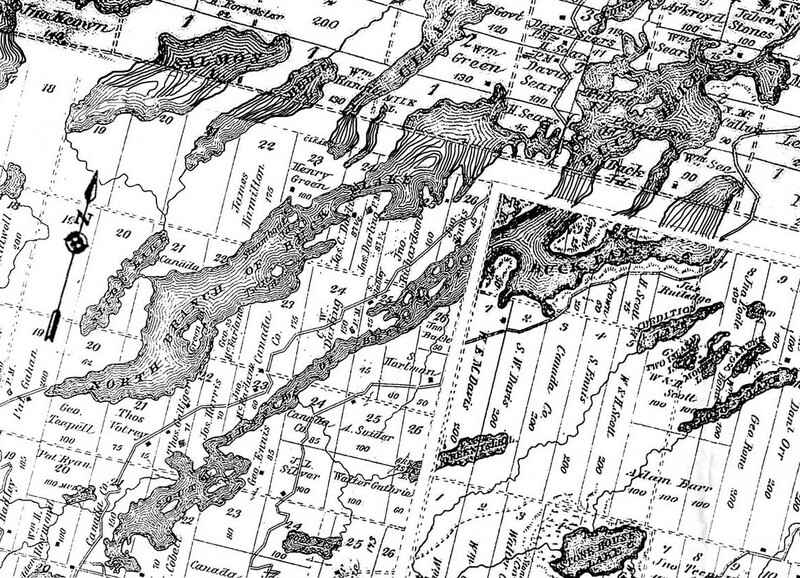 The names on this map include: David Sears, H. Sears, William Sears, Henry Green, William Green, Jabez Stoness, N. McCallum, William See, Benjamin Aykroyd, I. Cobett, James C. Darling, Joseph Darling, C.W. Darling, Joseph Harris, George McFarlane, George Teepell, Thomas Votrey, Thomas Galliger, George Ennis, John Ennis, James Hamilton, John Richardson, John Buck, S. Hartman, H. Scott, S.W. Davis, W.E.M. Davis, S. Ennis and James Rutledge. Jabez was proprieter of the Inverary Stage, leaving Queen’s Hotel, Brock Street, Tuesday, Thursday and Saturdays at 4pm, to Glenburnie, 6 miles, to Inverary, 11 miles. Mail from Inverary has been carried from early days by a stage driver who made his headquarters at Perth Road or Stoness’ Corners, as it was earlier called. 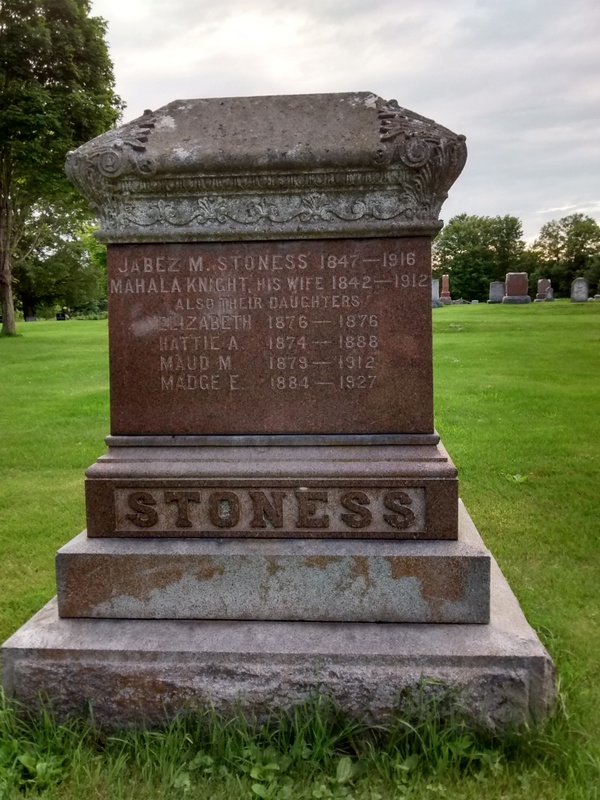 Mr. Jabez Stoness, who is remembered by many still living in Inverary, had the job for 27 years. He made the trip from Perth Road to Kingston and return 6 days a week winter and summer during those years. And he went through Inverary singing hymns. Following Stoness at this job was George Clough whose widow still lives at Perth Road. The next stage driver was Ernest Babcock and during his period the first auto bus was used. Following Babcock was a man named McDonald who held the position for only a short time but had the distinction of putting the second bus on the road. This second bus can be seen any afternoon before 4.00 p.m. on the street by the side of Kingston’s Post Office, waiting to start its return journey to Perth Road with freight, passengers, and mail for all the area on the Perth Road as far north as Bedford Mills. Charles Scullion, general merchant of Perth Road, is the stage driver at the present time. 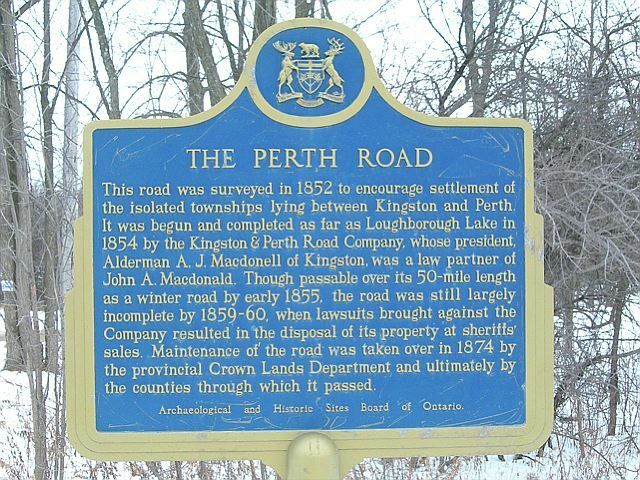 Perth Road was once a toll road with a scandalous history, operated by a company formed in 1850 by Sir John A Macdonald and partner John Counter. In 1854, the first 12 mile stretch of road from Kingston to Loughborough Lake was paved, and two toll booths were installed, which brought in £200 in revenue the first year. Jabez Stoness, who carried the mail for 35 years over the Perth Road, paid $3,000 in tolls over that time. By the winter of 1855, a winter road had been built all the way up to Big Rideau Lake, where Perth Road still ends today. Perth Rd was winterized in 1856. I wonder if this Samuel John Smith of Storrington, a possible relative on my mom’s side? I have totally given up on that name. About 1 ½ miles north of Inverary the Perth Road crosses Loughborough Lake by means of a steel bridge. It is at one of the narrowest parts of the lake and there has been a bridge at this narrows for many years. Mr. Gibson recalls the building of the steel bridge about 45 or 50 years ago. Apparently the wooden bridge which had been used was pronounced unsafe and a new one was projected. During the interval a ferry was used to carry passengers across the lake. The first trip of the ferry conveyed Mr. Stoness, the stage driver, to the south shore and Mr. Gibson made the first south to north crossing. The route changed when Perth Road, which was settled as a village in 1870, obtained a post office sometime later. Jabez Stoness built and operated a hotel there but got converted and sold it perhaps in the late 1870’s. He then became the first mail carrier on the route which began at Perth Road, stopped at Inverary, Latimer Post Office, (now Boughton’s corner) and Glenburnie Post office. He drove a two-seated wagon as a stage for passengers also in the warm weather and a two-seated cutter with robes in the winter months. He brought mail three times a week at first and later it became daily. Contracts were for four year periods. He kept the contract for 26 years. In the early days Loughboro Lake was crossed by a floating bridge. He sold out to George Alton who carried on for only a couple of years. Conflicting comments on the state of the Perth Road appeared in the local papers in the spring of 1878, when the Loughborough Lake bridge was being rebuilt. A raft was hastily constructed at Inverary to serve as ferry when the ice broke up early, and the swamp caused a delay in bringing up the timbers. The source of the trouble was an impatient farmer from the north, who insisted on loading two teams of horses to save making second crossing; this swamped the ferry and he lost team. 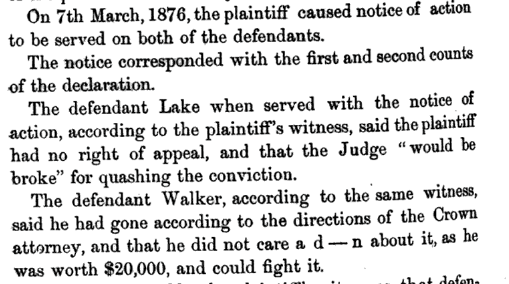 The proprietors of the road, who were not responsible for the ferry, eventually decided to make him a $100 payment, while denying liability. In December, 1878 the road was reported to be in good order as a result of the expenditure of large sums during the past few years, and Jabez Stoness, who drove the mail stage, said it was the best in the country, and had been in excellent condition during the fall, notwithstanding the heavy rains. Unfortunately this happy state was not maintained and in May 1885 two angry farmers from Inverary complained at the newspaper office that they had to Pay 15¢ tolls each way to Kingston although the road was in a most neglected state, almost unfit for travel and unsafe through dilapidation of bridges and railings. It was believed that those responsible for managing the road had ceased travelling on it. 12 years later, Jabez, 43, had a change of heart about the road and went to court for it. Even a toll road can deteriorate, however, and in 1890, Jabez Stoness, no doubt angered by a lifetime of paying fees, refused to pay any further tolls because of the condition of the road. Noting that the county engineer had deemed the road was “dangerous and impeding Her Majesty’s travel” Stoness argued that tolls could not be charged until the road was improved and he won the case. When Inverary began to get daily mail, instead of thrice weekly service, Mr. Stoness had even more opportunity for observing the state of the Perth Road, as he drove from Kingston through Inverary to Perth Road village. Heavy traffic of phosphate wagons did not improve its condition. 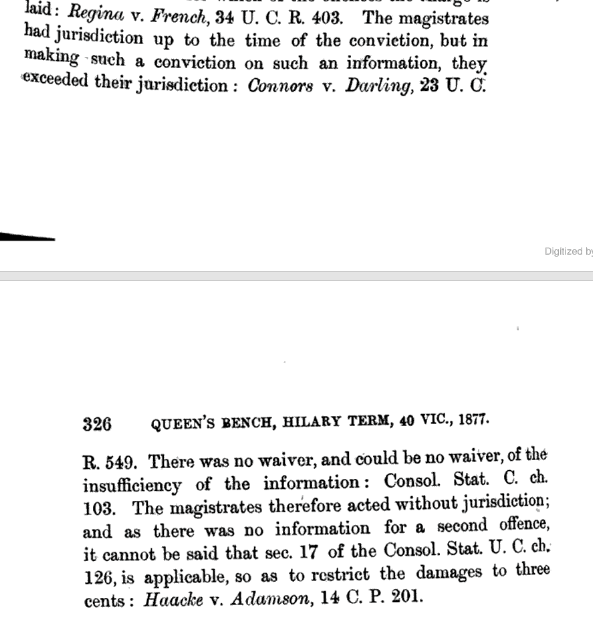 In September 1890 our local magistrate convicted Jabez Stoness (who was then deputy reeve of Loughborough township) of refusing to pay tolls to John Gibson and others. 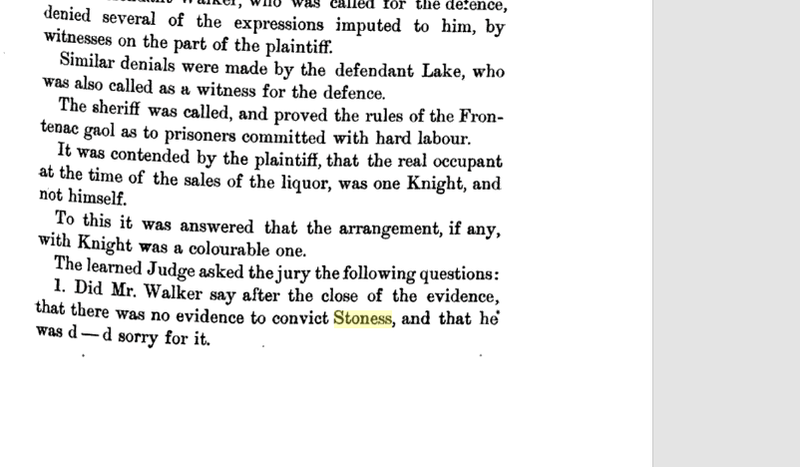 In a letter to the Kingston newspaper, Mr. Stoness explained that he was appealing the conviction because a county judge had instructed the county engineer to inspect the road, and he had found it “dangerous and impeding her majesty’s travel”. Under these circumstances it was illegal to charge any tolls until the road had been improved and the county engineer had submitted a favourable report on it. otherwise known as Stoness v. Lake and Walker. 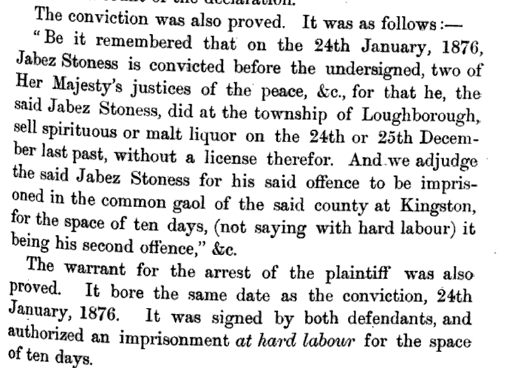 Jabez Stoness, did at the township of Loughborough, sell spirituous or malt liquor on the 24th or 25th December last past, without a license therefor. Reading the rest of the verdict, I think the judge awarded him three cents for his wrongful arrest and conviction. There were many businesses at that time – Jabez Stoness ran the Farmers Inn, which was an actual Hotel, I was told it had a bar in the front and rooms upstairs for travellers to rent, so they could rest from their long journey from Kingston to Westport, or even to the Perth area. (Thus the road came to be called The Perth Road). Jabez later closed the Hotel business because of (unknown) circumstances. He then started the stage coach run, carrying mail and passengers to Kingston. At first three times a week – then daily. Upon closing the Farmers Inn there was a interesting tale about Whiskey Barrels being rolled down the hill into the swamp. Jabez was also Reeve for a few years as were others – will mention those later. James Stoness and his wife Mary (Buck) operated the Post Office on the east side of Perth Road. Mary did some dressmaking (not sure if there was a store there at this time). That is why the village was called Stoness Corners for a time in history – because there was a Stoness on each side of the road. Robert Courtland Stoness was born on April 07, 1877 in Ontario, Canada, The Son of James Young Stoness and Mary C Buck. Robert Courtland Stoness passed away on April 13, 1877 in Ontario, Canada. A disturbing and sad tale of jealousy and murder in the woods north of Kingston in 1881 is the tale of the murder of John Richardson by Elijah Vankoughnet. Jabez was married to Fannie Sears at this time. Elijah married Maria Elizabeth Green. The Green family were the first settlers in the area. Elijah was executed at on the 28 Jun 1882 at 38 years old. KINGSTON, Ont., June 28. 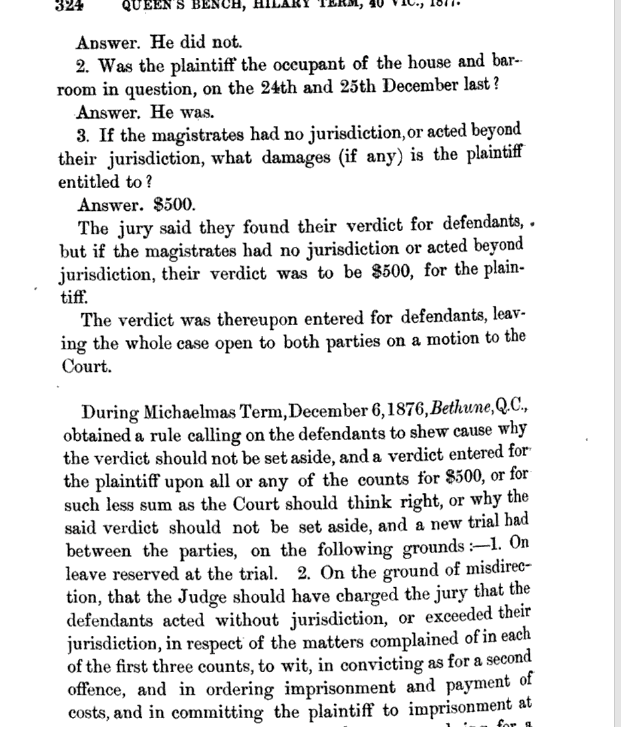 – This morning at 8:28 o’clock Elijah Van Koughnet paid the penalty of his crime – the murder of John Richardson on the 13th of August last near Buck Lake. Van Koughnet was a neighbor of Richardson’s, and about 8 o’clock on the night of the day named hid himself in the bushes on the farm of his victim, and While the latter was going to his house deliberately shot him in his tracks and left the body lying where it fell. 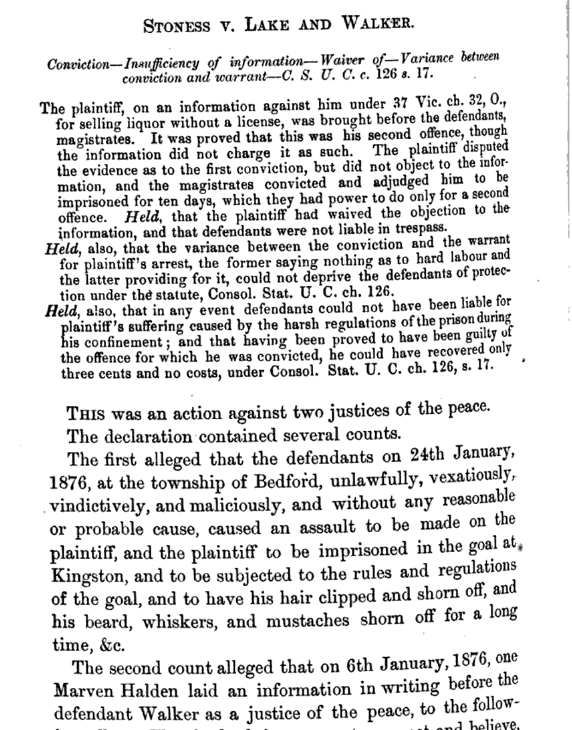 W. R. Freeman, a carpenter, who lived about a mile from Richardson testified that Elijah VanKoughnett borrowed a buggy from him on Sunday the 14th of August. On the 11th of August, the Thursday before the murder he had bought an old wagon and a boat from VanKoughnett for $10.25. VanKoughnett also had an old horse which he wanted to sell, but Freeman said he would not give him twenty-five cents for it, as it was old and crippled. Learning of the tragedy he followed the buggy marks to Richardson’s house. The tracks of the horse was a peculiar one, the animal throwing its feet out. Another set of tracks were found but a new horse was hitched to the buggy. The horse’s feet were larger. Freeman traced his buggy tracks to the house of John Sears, not because there were not any marks. Mr. A. Sears testified that VanKoughnett had previously told him, about a week before the murder, that he intended going away but before he did, he would do something that people would remember him by. Sears identified the gun in the court room as belonging to Richardson as he had saw him with it many times. Mr. A. Stoness testified he saw Elijah VanKoughnett on Friday August 19th at his house at Stoness Corner. VanKoughnett, Stoness and Mr. Downey left for Kingston and on the way VanKoughnett referred to Richardson’s gun. He said it was under Richardson’s haystack near the road and the left hand barrel was loaded. The prisoner was brought in to the stationhouse in Kingston. When the late Mr. Downey went into the island on Buck Lake in search of VanKoughnett he was not long in finding him. When Downey came upon VanKoughnett, the latter drew a knife from his pocket and threatened to commit suicide. Downey told him it would be better for himself and his family if he gave himself up, and he did so. A mining boom may have started when Christopher Roushorn discovers lead in Perth area in 1870. In 1894, the Stoness mine begins operation, mining Mica. Mica was also mined from several localities. It often occurs with apatite, so some of the apatite mines produced both products. The main mica mines were the Sand Lake mine, which opened in 1870 and was mined intermittently until 1912, and the Stoness mine, near Buck Lake which mined mica from 1894 to 1902. THE STONESS MINE. A syndicate consisting of Messrs. Pobert Kent and Joseph Franklin of Kingston, and Mr. Jabez Stoness of Stoness Corners, now control what was formerly known as the Buck Lake mica mine, located on lot 4, concession XII of Bedford. It is at the northeast end of Buck lake, about 9 miles from Stoness Corners. The mine was opened 15 years ago for mica, and under lease to Webster and Co. was sunk to a depth of 30 feet. The shaft is now 440 feet deep on a 45-degree incline toward the north 134 Bureau of Mines Report [ No. 5 northeast. There is also a vertical shaft 100 feet deep into the workings at the southeast end of the stoping chamber. Hoisting is clone with a 20-h.p. engine, winding a |-inch steel cable, drawing a kibble mounted on a four-wheel truck. Steam is derived from a 50-h. p. water tube boiler. Drilling is done by steam drills. The lower part of the mine is quite dry, but water nearer the surface is drained to a sump at the bottom of the 100-foot shaft, and is pumped to the surface by a Northey pump, 4i by ,2| by 4 inches. The average cross-section of the incline is 16 by 40 feet, and the stope varies from 30 to 40 feet in width, with an irregular elevation, at places reaching to a height of 60 feet Above the mine is a building divided into rooms for the boiler, hoist, store-room, and for mica trimming. Dynamite is stored in a frame magazine 400 feet east of the shaft, with a hill between. A dwelling house of 8 rooms has also been erected 300 feet north northeast of the shaft. The output of mica from this mine has been a ton a day for many months. The crystals of mica here are of exceptionally large size, and very free from blemishes. The body of the vein consists of pink calcite, the mica occurring along the walls between the calcite and ths bounding pyroxene. The trend of the vein is about north northeast, cutting the gneissoid country rock. The mine is said to be the heaviest producer of fine mica in Ontario. The manager is Mr. Joseph Franklin, with Samuel Hunter as foreman. The number of workmen employed was 30- The same parties are also doing development work at numerous points on lot 5 of the same concession, about a quarter mile west northwest of the Stoness mine, where the mica occurs in pyroxene without calcite. The owners are contemplating the installation of a Taylor hydraulic air compressor at the falls on the outlet of Buck lake, 3,000 feet northeast of the mine, to develop power for all purposes at the works. Robert Neil STONESS was employed Manufacturer 1916 in Village Of Westport, Ontario. : Charles and Robert were the executors to Jabez’s estate. Robert married Myrtle Carthenia UNKNOWN. Jabez was buried 14 Dec 1916 in Wilmur cemetery with my grandparents and relatives.